Potatoes make great snacks. Everybody's favorites are french fries; others go for baked potato slices. 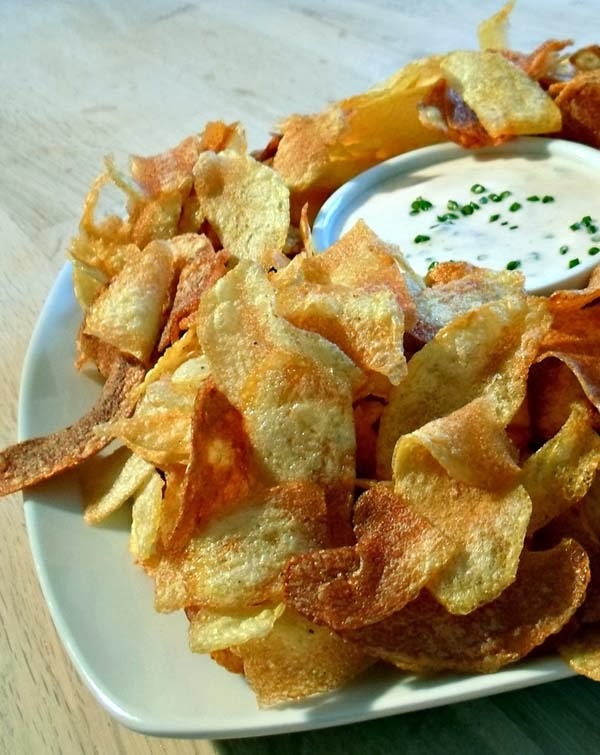 Just as easy to make are homemade potato chips. What are the best potatoes to use for homemade chips? Well, when it comes to dishes to make with potatoes, almost any type is suitable. But generally, Russet and other all-purpose potatoes will do just fine. 1) Prepare the potatoes by peeling off the skin. 3) Slice up the potatoes. Use a mandolin (as recommended in the video). In absence of a mandolin use a knife or use the potato peeler. When using a potato peeler, keep peeling in the same spot so that large sizes are sliced off. 4) Wash potatoes in cold water. The video did not recommend this step, but just like in baked potato slices, I believe that washing off starch is important for crispy potatoes. 5) Dry the peeled potato slices on a paper towel. 6) Fry potato slices on high in small batches until they turn golden and crisp up. 7) Remove as they cook and drain on paper towel. 8) Serve with any dip or seasoning of your choice. The balsamic vinegar mentioned in the video is something I'll be trying in the future. This short video should help. A high-heated flash fryer is used in it, but satisfactory results can be had using a portable deep fryer or, in my case, just a skillet.